Do you believe you are a great shooter, a flawless ballhandler or the most explosive player on the court? Now you can prove it all with DRILLS! Athlenda drills are specially designed for young players like you by Ganon Baker – a Top NBA Basketball Development Specialist. It’s a selection of 5 crucial exercises, to unveil your skills to basketball professionals from all over the world. You should understand that by documenting yourself doing the drills and uploading them on Athlenda, you increase your visibility on the platform, get more chances to be properly evaluated by basketball professionals and get a step closer to your dream. Why? Cause if executed properly, drills can help you present your basketball profile and prove your strengths and skills. They all offer basketball professionals a 360° view of what you can do on the court, reveal what you are good at, where you need some improvement and most importantly what’s your future potential. Also, by measuring yourself in all 5 exercises, you make a step towards better understanding yourself as a player and see where you stand against the competition. This will keep you motivated to practice more and become the very best version of yourself. So, let’s see what each DRILL is really all about! The first drill, U-Stance, is to prove hand quickness and dexterity. Performing this drill with intensity shows a high level of balance in a player’s body. Make sure to try it to see where you stand today and gradually improve. The hook shot is not a skill solely suited for big men. Performed correctly, the hook shots develop your ability to finish with both hands while shielding the ball from the defender with your body. Set up your move with solid footwork and show your post-up game. Floaters are all about technique and rhythm. It is a difficult shot to master and demonstrates your shooting touch from the mid-range. Make sure you are also showing the way you come off screens and keep your dribble tight. Finishing with both hands is a big plus! Being capable of hitting the 3-pointer is an increasingly valuable skill for all positions. This is an opportunity to show your accuracy and quickness. Can you get shots up quickly without getting tired and keeping your shooting mechanics consistent? Then prove it! Finally, let’s put all these skills together. Be decisive with your dribble moves. Dribble with a purpose, get to your spots quickly and keep surveying the court as you would during a game. Demonstrate your ball handling and pull-up shooting in a game-like situation! 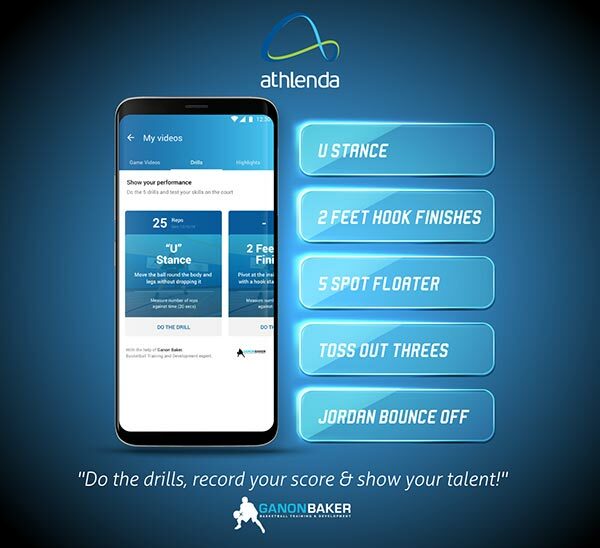 So, get on the court, do the drills, record yourself and let nothing stop your future with Athlenda.